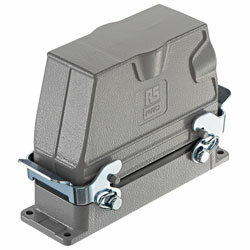 RS Components now offers a new range of RS Pro heavy-duty connectors which includes screw terminals, cage-clamp terminals and housings. The components provide excellent value for customers and are intended for the industrial environment, especially in sound and lighting applications, as well as the robotics and machinery sectors. The RS Pro A and B series of inserts include screw terminals and cage-clamp terminals, which offer excellent electrical and mechanical protection and UL approvals. All the inserts have a grounded contact to stop incorrect polarisation and have contacts mounted in the insert, which means no extra tooling is needed. The inserts are offered in popular contact-number sizes including 3 PE, 4 PE, 6 PE, 10 PE, 16 PE and 24 PE. Other features include insulation resistance of not less than 10 giga-otashhm; ability to withstand more than 500 mating cycles; industrial operating temperature range from –40C up to +125C; and UL90V0 flammability rating.